Bitcoin and other digital currencies have experienced increased volatility, in the last weeks. This resulted in sharp declines to the value of Bitcoin and other cryptocurrencies, against the U.S. Dollar. This has caused noticeable disruption in economies worldwide. Investors and daily Bitcoin users experienced as much as 33% decrease in buying power as a result of the market crash. Many RAD WEB HOSTING clients pay for services exclusively in digital currency. We've launched a Bitcoin Bailout solution in an effort to assist users facing economic difficulties. Users will receive rebates of 100% of new Shared Hosting and KVM VPS orders in December 2018. There are no restrictions of rebates users can receive. Rebates will be issued regardless of payment method and anyone can take advantage of the Bitcoin Bailout. 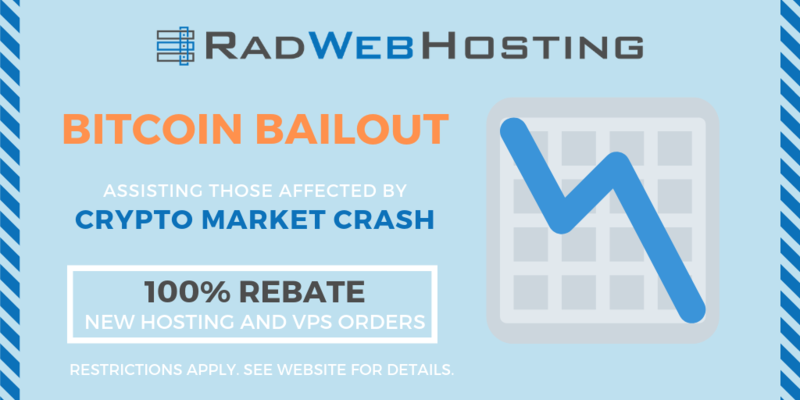 All rebates will be credited to the users' accounts, equal to 100% of the Hosting and VPS orders placed. Domain names, premium software licensing and any gateway service fees are not eligible for rebate. Account credit is good towards future invoice and cannot be withdrawn. Please refer to the Terms of Service and all Legal Policies for further information.